Actual deck measurements vary and there is no standard width and length is defined. Homeowners might design and build any reasonable shape and dimensions deck on their private property. But before digging the ground for a deck foundation, always check building codes and city regulations. In some areas there might be some restrictions to building any outdoor structures including decks. What is an optimal deck size? While designing a new deck always take into account its practical use. Tiny 4’ x 6’ area is good enough to place couple chairs and small tea table. At the same time 78” long patio chase lounge won’t even fit on such deck. Typically 10’ x 12’ or 12’ x 14’ very common deck dimensions. 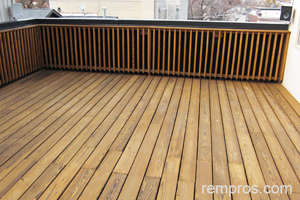 Pressure treated wood is widely used for building decks. Very often combination of a few different materials used for constructing a new deck. Welded together steel joists, railing and stairs on steel posts in combination with exotic hardwood or composite decking screwed directly to metal frame is an extremely durable and long lasting structure. Sizes of rooftop decks are normally limited by actual roof dimensions. There are not many possibilities to expend the area besides maximum rational usage of existing flat roof space. Style and size of a house always play crucial role in determination of how big a deck could be built. Adding 350 – 400 ft2 deck to 20’ wide and 30’ long one story house is not the best solution. But if the first floor of the house exceeds 1200 square feet 15’ x 25” deck might be a perfect match with overall house exterior style. On standard city lots building a spacious deck might be impossible because of lack of a space. If the distance from house to free standing garage is about 20 feet leaving at least half of space for nice green grass and landscaping could be a more preferable solution compare to covering all backyard with the deck. Size factor certainly will affect the cost to build a deck, but materials and design will have much higher impact on the price determination. Lumber deck normally is the cheapest option. Purchasing wood from local home improvement retailors or lumber yards and building simple rectangular deck with elimination of custom elements will save you the most. Building 14’ x 18’ pressure treated lumber deck on wood posts might be estimated a few times cheaper in comparison with building stylish 8’ x 10’ ipe or teak deck on steel posts. Adding low elevation simple wood deck to the house is certainly the project could be done by handy homeowners with basic construction skills. Incorporation of stone tile, curved stairs and glass railing into hillside deck design is much more complicated task and it is much better option to hire a professional contractor for completing such project. It is not the smartest idea to make big investment into purchasing expensive materials and at the same time trying to save on labor what normally will result in poor on-site work.